As the sun settles in for the evening, the lights of Casino Croisette in the downtown core of Cannes in Provence, France brightens the street. 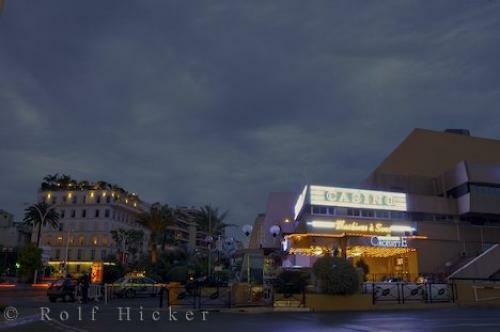 Photo of the bright lights of the Casino Croisette in downtown Cannes in Provence, France in Europe. ... Many famous people are seen at this casino as the French Riviera is a second home to many of the people that are well off in the money department. Whether going to Casino Croisette for the slots, food or entertainment, be sure to dress appropriately as the atmosphere rings with elegance.Casino Croisette in downtown Cannes, The Riviera, Cote d'Azur, Provence, France, Europe. I photographed this photo with the digital SLR camera model Canon EOS-1Ds Mark II, aperture of f/13.0, exposure time of 16/5 sec. on ISO 100, as always I used a original Canon Lens, the focus lenght for this picture was 32mm.